How Long Does It Take To Become a Police Officer in Michigan? Police officers are often considered the preservers of law and order in civilized societies. As law enforcement officials, these officers have an important responsibility to uphold law and ensure that the community is abiding by the laws that govern it. This results in an orderly and safe society for everyone.Police officers carry out a large variety of tasks in the carrying out of their job. Furthermore, this occupation is often difficult, demanding, and sometimes very dangerous. The training process can also be quite challenging. If you are considering a career in law enforcement or wish to find out more about a police officer’s job, read on. Police officers are entrusted with a variety of responsibilities and duties in order to ensure that law and order are preserved in society. What Are the Minimum Requirements to Become a Police Officer in Michigan? In Michigan, the Michigan Commission on Law Enforcement Standards or MCOLES is the authority which sets the professional standards for law enforcement and criminal justice. Candidates aspiring to become licensed law enforcement officials must meet the minimum selection criteria set by MCOLES and gain its approval. The precise selection criteria are listed in the Employment Standards for Michigan Law Enforcement Officers. The time that it takes to become a police officer will vary according to each individual candidate. For instance, some individuals may have prior experience and so their training time may be less than those who have no training. With respect to basic training, all approved training academies are required to teach about 594 hours’ worth of curriculum. Then you must also factor in all the other tests you must take. If you wish to get a general idea of how long it will take you, it is advisable that you get in touch with the police agency you intend to apply to and work with. Explain your background, and they may be able to give you an idea of the time-frame you will be looking at to become a police officer. What Are the Steps to Becoming a Police Officer in Michigan? The U.S. Bureau of Labor Statistics compiled data which indicates that the rate of employment growth in this field is projected to rise 5% between 2012 and 2022. Police officers and law enforcement are essential features of any community. They work to keep their cities safe and orderly by upholding the law. 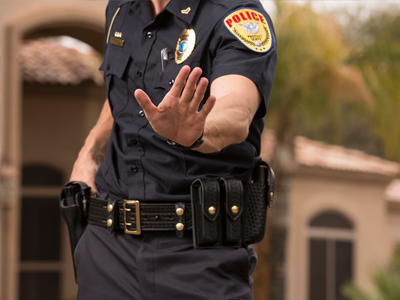 If you wish to become a law enforcement official, there are a number of steps which must be taken, including extensive and demanding physical training. Be sure to familiarize yourself with the specific requirements set out by MCOLES for the state of Michigan and then proceed to completing all the necessary tests. Good luck! Q: How are the minimum requirements for becoming a police officer in Michigan determined? Ans: In Michigan, the Michigan Commission on Law Enforcement Standards or MCOLES is the body which sets the professional standards for criminal justice and law enforcement. In order to become licensed law enforcement official, all candidates must meet all of the minimum selection criteria which is set by MCOLES and gain the approval of this body. For the selection criteria on how to become a police officer in Michigan, please refer to the Employment Standards for Michigan Law Enforcement Officers. Q: What are my job prospects if I become a police officer in Michigan? Ans: According to the US Bureau of Labor Statistics, the employment growth for the field of law enforcement is expected to rise 5% between 2012 and 2022. In 2013, O*NET OnLine reported that the annual salary for Police and Sherriff’s Patrol Officers was $55,000 and for Detectives and Criminal Investigators it was $81,200. Keep checking these two websites for the latest figures related to job prospects in the field.